I always grab the mail when I'm waiting for Pierce to come on the school bus. Right now we're flooded with catalogs and junk mail. So recently when I pulled out a long, thin cardboard box, I was just happy to have something that wasn't trying to entice me into spending more money. The box was from Taste of Home, which seemed weird, since I hadn't ordered anything. And it had a letter(not the typical bill looking type deal) attached to the front. I opened the letter and it brought a smile to my face. It said that one of my recipes was published in their 2012 Almost Homemade cookbook, so they were sending me a complimentary copy! The winter that the twins were infants, I spent a lot of my spare time creating new recipes, and I would frequently submit them to Taste of Home. I'd totally forgotten about it (just like I've forgotten much of what occurred during the first 6 months with the twins!). What recipe could it be? I didn't even remember what all I'd sent to them. Turns out that you will find my recipe for Pear-Blueberry Granola, which is made in the crockpot, on page 174. It's delicious and fairly healthy, and makes a great dessert in addition to being a wonderful breakfast. 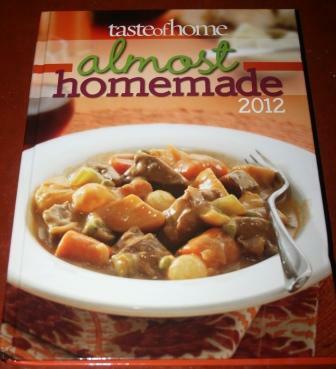 And I'm so excited to be included in Taste of Home - I've been a huge fan of their cookbooks and magazines since 1998! Now that was a good mailbox surprise! And now I have a new cookbook to boot! If you haven't already entered my giveaway from Eco Natural Soaps, please check it out here! I've tried some of the recipes you've posted here and they are all good. I am a big fan of Taste of Home as well. Their cookbooks are very nice. Congratulations to you on your recipe being published!! Congrats! Taste of Home is a great magazine.I subscribed to it for several years when we were first married and I was learning to cook! Congrats! I love Taste of Home! I will have to look for your cookbook. Congratulations Lisa!!! That is fantastic news. You have got to be so proud of yourself. I know I would be carrying the book around and showing everyone I know. Lisa-that is so cool!! The granola sounds delicious, too! Congratulations, Lisa! Did you submit this recipe? Congratulations! What a cool surprise in the midst of all the junk mail! Congrats Lisa! What a treat! I've gotten this magazine for years and I love it! Happy December! That's totally awesome! And such a nice surprise this time of year! Wow, this is so exciting, now you are in a published cookbook! I LOVE Taste Of Home, and I subscribe to it now and then. I like that it has great pictures and no ads! I really don't know how they can publish with no ads. Anyway, I used to order these cookbooks. How on earth did you have time to do all this recipe experimenting with newborn twins? Most people are exhausted with just one! Must be that you have great stamina and energy from running! Awww, Lisa I am so happy for you. And that recipe sounds so yummy. Would you share it in blogland? Okay I think my previous comment just vanished. Again, congrats with being published. That pear recipe sounds yummy. And crockpot.... is so fun to cook with. Would you share the recipe with us bloggers? That's wonderful. I'm not at all surprised. You are one of the most creative meal planning Mama's I know. And very healthy foods to boot! OMG! That is absolutely amazing! Congrats! I'm so psyched for you. How very cool. :) And now I want the recipe. Yum. It sounds goooood. What a lovely gift, I would like that granola. Congrats! That was certainly a nice find indeed in your mail box! congrats - doesn't that feel cool? Wow! Wow! Wow! Now that is very exciting! Congratulations! I love Taste of Home too! My Granny used to get their magazine cookbooks and I found one of the hardback ones at a book sale at the library and bought it. Now you've got me wondering what I did with those magazines that Granny gave me. I hope I didn't toss them! That is incredibly cool, and if it was good enough to be in Taste of Home, it must be GREAT! They have the best recipes! Congratulations! Taste of Home is one of my favorite magazines, and I have four of their books. Lisa!!! I am so excited for you! I love Taste of Home too! My mom actually buys me one of those cookbooks every single year. Though I've never known anyone in them--how cool! This is so cool Lisa!!! And the recipe sounds wonderful. I know exactly what you mean about getting the mail, it's often so depressing. That is really exciting! Sure beats finding more bills in your mailbox. Maybe it's time to think of publishing your own e-cookbook? Congratulations! That's definitely something to be proud of! Congrats! I'll have to check you out. I love all their magazine and cook books!